A new drive is underway to identify a suitable occupier for an historic city centre church following the opening of a major new food and entertainment complex close by. The Grade II Listed St. John the Evangelist Church in Hanley has stood empty since the late 1980s before being carefully restored a few years ago. Now marketing agents Mounsey Surveyors believes the time is right for a renaissance of the church which dates back to around 1787. “The development of the Hive at the Intu Potteries Centre has added significantly to the footfall in the area and will be a significant driver for more development on the northern side of the city centre,” said Tom Johnson, Chartered Surveyor at Mounsey Surveyors. 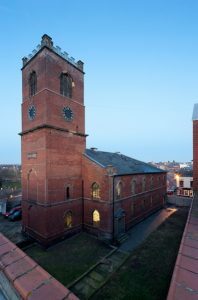 Owners, Church Converts LLP, have carried-out extensive work to ensure St. John’s remains weatherproof and in sound internal condition. The building comprises 8,410 sq ft of internal space that is located on a secure site area benefitting from dedicated car parking. St John’s was among the first building constructed using cast iron and is therefore of architectural significance. Since purchasing the building amongst a portfolio of assets from the Church of England, Church Converts LLP has invested substantially in the building to repair it, bring out the best of the historic features, and present it as a beautiful space for future tenants to exploit. For further information, please contact Mounsey Surveyors on 01782 202294 or visit the website, www.mounseysurveyors.co.uk. Based on Festival Park in Stoke on Trent, Mounsey Chartered Surveyors is a property consultancy specialising in commercial property advice. Mounsey Chartered Surveyors provides high quality professional advice to all forms of organisation from Public Bodies and PLC companies to private individuals. Founded six years ago by Chartered Surveyor Richard Mounsey, the company has grown to employ eight people and works primarily in the commercial real estate markets. For further information, please go online to www.mounseysurveyors.co.uk.